Each month the Anoka Knights of Columbus choose a family that models Christian family values and visibly live by them every day. The family chosen for February 2019 is the Erkens Family. 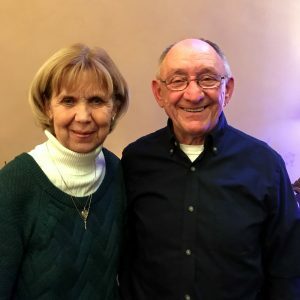 Ken and Judy Erkens have been parishioners at St. Stephen’s since 1972. They had 3 children. When their children were younger each of them volunteered a lot at St. Stephen’s Catholic Church and were involved in many community activities. Ken and Judy are both Eucharist Ministers and are involved in many things at St. Stephen’s and in the community such as with Habitat for Humanity, Meals on Wheels, Feed My Starving Children and with various activities at Champlin Park High School and Jackson Middle School. Both of them also help with the Anoka Knights ham and turkey bingos, pancake breakfasts, and Lenten fish dinners. Ken is a Past Grand Knight of the Anoka Knights of Columbus and has held many other officer positions within the Knights over the years. He is currently the coordinator of the Lenten Stations of the Cross, and volunteers with the Anoka Knights Haunted House, the Anoka Knights Youth Free Throw Competition, the Knights’ of Columbus Campaign for People with Intellectual Disabilities (Tootsie Roll Drive) and with the maintenance at the Anoka Knights Hall.